Just so you know, you can find me on Pinterest! It's an online pin board of everything that insprires you, anything at all! Craft projects, cute outfits, haircuts, Christmas lists, whatever! 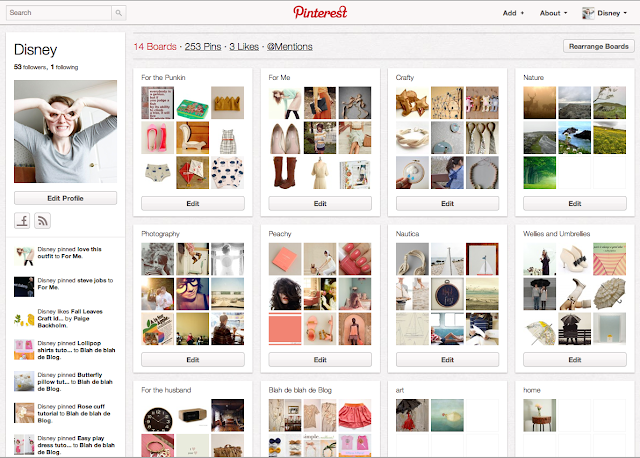 You can either browse other people's pins, or pin anything from almost any website. I've been pinning there for months, but for some reason I haven't shared it here! So if any of you want to find me there, I would love that! And If you haven't tried Pinterest, you might want to. :O) It's terribly addicting! (And no, they aren't paying me to say that.) You have to request an invite, but it usually doesn't take more than a day to get one and then it's free to sign up! Have a great day, guys! Your for got the warning it is adduting. ;) I will look you up there. Following you now!! I love Pinterest!! I was on board with Pinterest when it was still in beta. I adore it! And now I can have you + Pinterest. At. The. Same. Time! Bliss. I just joined Pinterest last week! Now I'm following you. I only wish I had joined sooner! I am going to check out your boards, Pinterest is such an inspirational wonderland, but it is addicting! Yay! for pinterest! I love it and it is incredibly addicting! Crazy fun! How crazy is that? I just joined Pinterest... The same day you did! Total pinterest addict here. I've decided that I'm starting a board that is "Pins I've Tried" be it a recipe or a craft/sewing project or an organizational idea, you get the idea. I love all the ideas I've pinned, so why not actually DO some of them, you know? I'm excited. Love your boards and blog. Love Pinterest!!! I am definitely following you now!